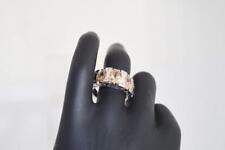 SIMULATED DIAMOND CLUSTER STERLING SILVER PLATE DRESS RING. Stone Type: Simulated Diamond. ★★★ Clearance Bin ★★★ (640). ★ Sterling Silver (578). Stone Colour: Clear. ★ Body Jewels (1379). ★ White Gold (30). One gift box. Free handling.